You can see replicas of the ark in Netherlands and Hong Kong and Canada. But the most spectacular replica is a 510-foot long boat at Ark Encounter, a theme park in Williamstown, Kentucky, 40 miles south of Cincinnati on I-75. "An undeniable spectacle . . . it must be seen to be believed" (Chicago Tribune) "Amazing," "Still in awe," "Totally worth it," "Great attention to detail" (TripAdvisor reviews). Eventually the park will also contain the Tower of Babel, a first-century Middle-Eastern village, a boat ride down the Nile, an aviary, a petting zoo, and more. Ark Encounter was built by Answers in Genesis, which also built the Creation Museum about 45 minutes northwest of Williamstown in Petersburg, Kentucky. For more information see http://arkencounter.com. Johan Huibers was a successful Dutch contractor who became a Christian when he was twenty-four years old. 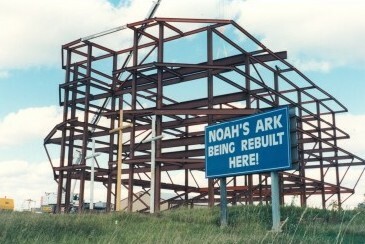 He eventually realized he could share his new faith by building a replica of the ark. At first he built a half-size (220 feet long) ark, which opened to the public in 2007. For more than three years Johan’s ark traveled the canals of Netherlands, stopping at twenty-one mooring places to “give children something tangible to show that Noah’s ark really existed,” and “to tell them there is a God who loves us.” But John Huibers had bigger dreams. He sold his half-sized ark and built a full-sized one (450 feet long) which opened to the public in July 2012. The full-sized ark now towers above the flat Dutch landscape in Dordrecht, just south of Rotterdam. For more information see www.arcofnoah.org. Thomas Kwok, a real estate developer and, with his two bothers, the third richest person in Hong Kong, became a Christian when he and his wife went through an Alpha Course. In the early 2000s, Kwok’s company began to develop a 240-acre island in the Hong Kong harbor, including a five-thousand-unit apartment building and a family-oriented amusement park. Because of his Christian faith, Thomas convinced his brothers to build a life-sized replica of Noah’s ark to “promote education and interest as well as love and harmony.” And the biblical account of creation. The five-story life-sized ark includes a forty-three-room hotel, a fine dining restaurant, and an “Ark Expo”—displays, dioramas, and a children’s creation museum. 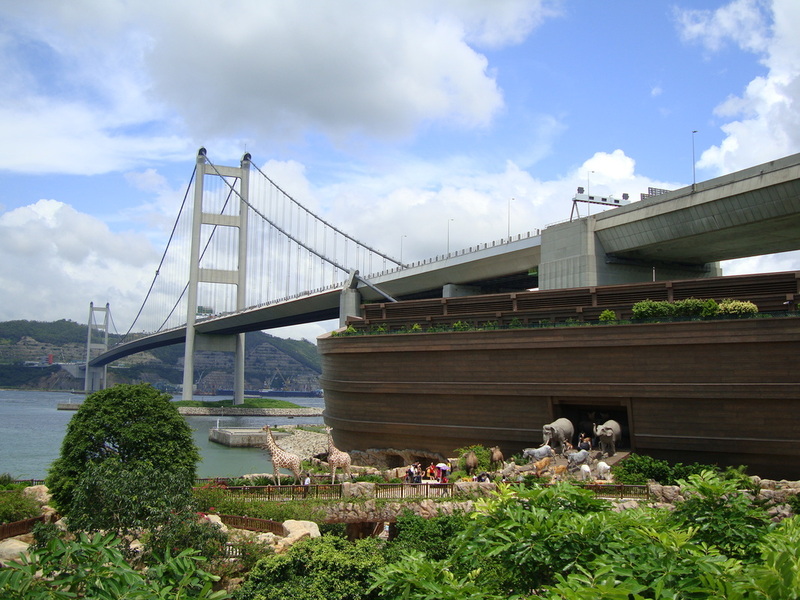 Unlike Johan’s ark, which is seaworthy, the ark in Hong Kong was never intended to float. It’s a stationary building. For more information see www.noahsark.com.hk. Paul Smith’s father started a church in New Brunswick in 1945, and since 1979 father and son have been working together. They have pastored the Burnham Road Cathedral, started a Bible school, supported missionaries . . . and built an ark two-thirds the size of Noah’s. The ark contains dormitory rooms for students in the Bible school, administrative offices, and healing rooms. It is also used as a retreat center. For more information see www.brministries.com. Richard Greene, pastor of a non-denominational church in Frostburg, Maryland, said that in 1974 God told him in repeated dreams to build an ark on a hillside next to Interstate 68. Groundbreaking was in September 1974 and steel beams for the first phase were installed twenty-five years later. The church is raising money to finish the first phase. When completed, the building will be a church and conference center. For more information see www.godsark.org. ARK ENCOUNTER's 510-foot long, 85-foot wide, 51-foot tall ark is said to be the largest timber frame structure in the world. JOHAN'S ARK: The 450-foot long replica of the ark is seaworthy and has a restaurant, a movie theater, an ampitheater, and meeting rooms. 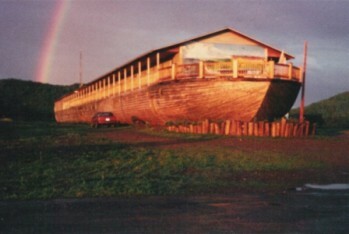 NEW BRUNSWICK ARK: The Canadian ark is 300 feet long, 36 feet wide, two stories high, and sits on top of a small hill just outside Florenceville, New Brunswick. MARYLAND ARK: For nearly forty years a life-sized replica of the ark has been under construction in Frostburg, Maryland. This is the official website for Noah: The Real Story. Copyright © 2014. All rights reserved.